On Sunday 11 November 2018, it will be one hundred years since the signing of the armistice that ended the First World War. To mark this, staff and students from across UCL, and many of the students from partner schools will be honouring all those who fought in the Great War by taking part in national and local events and paying their respects privately. A wreath will be laid at the UCL war memorial in the main Quad from Friday 9 November until Monday 19 November for staff and students to reflect in peace. There will be also be wreaths laid and three ceremonies held by UCL Medical school staff and students at the UCH Medical School in the Rockefeller Building, the Middlesex Hospital Medical School and the Royal Free Medical School from 10:45 am on Friday 9 November. All are welcome to attend. In a lunchtime lecture on Wednesday 13 November, Dr Georgina Brewis will talk about the significant impact of the First World War on life at UCL. Over 2,600 members of the university community served during the war, and UCL was requisitioned as a military hospital while the research activities of many academic departments were directed to the war effort. Student numbers halved during the war, but UCL also welcomed and supported several hundred Belgian refugee students and military personnel taking evening courses. Dr Brewis will talk about how women formed a majority of the much-reduced student body, playing a leading role in College life. They set up UCL’s Voluntary Aid Detachment, which maintained an Ambulance Squad in St Pancras, London and sent students to nurse in military hospitals in France. At the end of the war, the first government scholarship scheme for ex-service students helped produced a more socially diverse student body, while the fallen were commemorated around UCL’s campus. Throughout 2018, students from schools across the country, who have visited the Western Front as part of UCL’s First World War Centenary Battlefield Tours Programme have been involved in a number of community legacy projects. These have included creating a Remembrance Garden at Walton High School in Staffordshire and students at the Henry Tyndale Special School in Farnborough have pledged to take one step for every soldier who died, resulting in over 23 million steps being taken worldwide so far. It is estimated that the total reach of these many projects is already over fifteen million people. More recently, school students have been involved in commemorative First World War literature tours, travelling to the Somme and Flanders Battlefields with UCL staff to explore poems from a number of poets including Wilfred Owen, Carol Ann Duffy and Vera Brittain. Staff and students will also remember and share stories of the poet Isaac Rosenberg who studied at the UCL Slade School of Fine Art between 1911 and 1914. Rosenberg’s self-portraits are hung in the National Portrait Gallery and at Tate Britain and his poem, "Break of Day in the Trenches" is widely acclaimed as one of the greatest war poems. Other Slade school members who experienced the War as artists, soldiers and civilians will be remembered in an Armistice pop-up exhibition at the UCL Art Museum from Friday 9 November. The artists include Stanley Spencer, Winifred Knights, David Bomberg and William Orpen. 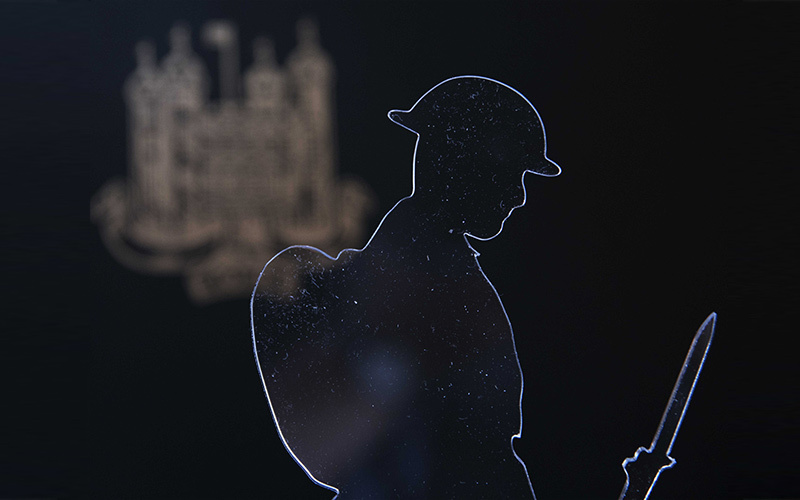 UCL Special Collections have also been involved in remembrance events, developing a First World War education programme as part of the ‘Shrouds of the Somme’ art project. On display at the Queen Elizabeth Olympic Park, the project stems from the work of artist Rob Heard who has spent the past five years hand-making more than 72,000 small shrouded figures representing the men killed in the bloodiest battle in British military history whose bodies were never recovered. Since September, 18 educational workshops have been held in the neighbouring Olympic Park boroughs to help students investigate the Battle of the Somme, what it was and how and why we remember it.